'Tiana Zander is the first of a new species on planet Mobius. born from Comm. 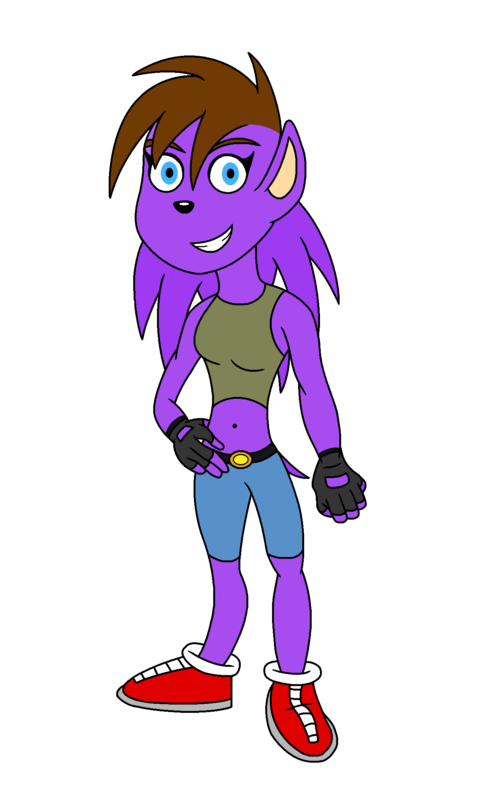 Alan Zander and Queen Aleena Hedgehog, "Tia" is a Human/Anthro Hybrid. prior to her birth, such interspecies relations between "Overlanders" and "Mobians"
as well as their conception of Tiana proved this fact to be false. looked down on Tiana as an "Abomination", and a "Freak of Nature"
and, have tried numerous times in her life to kill her. As a teenager, Tiana is every bit the "wildfire" that her mother was at her age. and, tries hard to be fair and kind, treating all people and creatures as equals. Tiana has a good relationship with her half-sister; Sonia. as well as Sonia's best friend; Princess Sally Acorn. Tiana also has a close relationship with a human named: Martin. her Sonic-like shoes serve a purpose: They were a gift from Sonic, as his brand of shoes NEVER wear out. I feel I must remind watchers that when it came to Tiana's design, I wanted her to truly look like a Hybrid Species. None of that "Humans with Animal Ears", or "Human-Like Animals"
her being a furry humanoid with animal features makes her a seemless blend of a Human and Anthro. This artwork may have some "minor errors", but I think it's authentic enough for posting.